Experimental solid mechanics is the study of materials to determine their physical properties. This study might include performing a stress analysis or measuring the extent of displacement, shape, strain and stress which a material suffers under controlled conditions. In the last few years there have been remarkable developments in experimental techniques that measure shape, displacement and strains and these sorts of experiments are increasingly conducted using computational techniques. 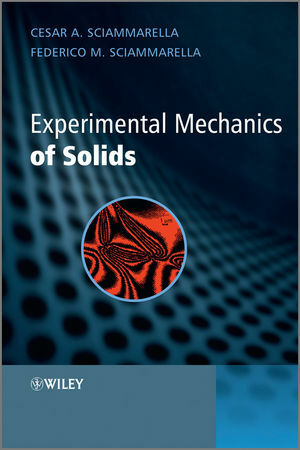 Experimental Mechanics of Solids is a comprehensive introduction to the topics, technologies and methods of experimental mechanics of solids. It begins by establishing the fundamentals of continuum mechanics, explaining key areas such as the equations used, stresses and strains, and two and three dimensional problems. Having laid down the foundations of the topic, the book then moves on to look at specific techniques and technologies with emphasis on the most recent developments such as optics and image processing. Most of the current computational methods, as well as practical ones, are included to ensure that the book provides information essential to the reader in practical or research applications. This comprehensive book forms an invaluable resource for graduate students and is also a point of reference for researchers and practitioners in structural and materials engineering. Cesar A Sciammarella is Adjunct Professor in the Department of Mechanical Engineering, University of Illinois, USA. In the past he has worked as a consultant for companies including: General Motors, Goodyear, Honeywell Corporation, Rand Corporation, Rockwell International, Sundstran, Uniroyal Tires, IBM, Tryodyne, Samsung, Case Corporation. A renowned experimentalist, his research currently focuses on developing techniques in solid mechanics and he has spoken at many conferences and published prolifically in journals which include Strain; Optical Engineering; SEM Conference on Experimental Mechanics and Journal of Strain Analysis for Engineering Design. Federico Sciammarella is Assistant Professor in the Department of Mechanical Engineering, University of Illinois. His research interests centre upon using optical methods for characterization of materials and structures including failure analysis. Over the past five years he has written multiple journal and conference research papers.